Both Barefoot Contessa recipes were perfection. I actually compared Paula’s red velvet recipe with that of my Nana’s and made a few adjustments accordingly. I was so confident that I didn’t need a whoopie pie pan according to Paula’s instructions. Well that was false – her instructions did not work out, as the batter would spread so thin and combine to make a large pancake-like creation. I did cut that large pancake into circles in order to make whoopie pies, but I also saved enough cake batter to make a small round cake. Maybe next time I might pour a small amount of batter into a cupcake pan so that the teaspoons cannot spread…. Needless to say by January 1, I had nearly killed both of us and we could barely move. We decided to watch Mad Men on the Roku all. day. long. We have never caught the Mad Men fever but that changed after watching 2.5 seasons back-to-back. Now that is our nightly show so that we can finish season four before season five begins this spring. 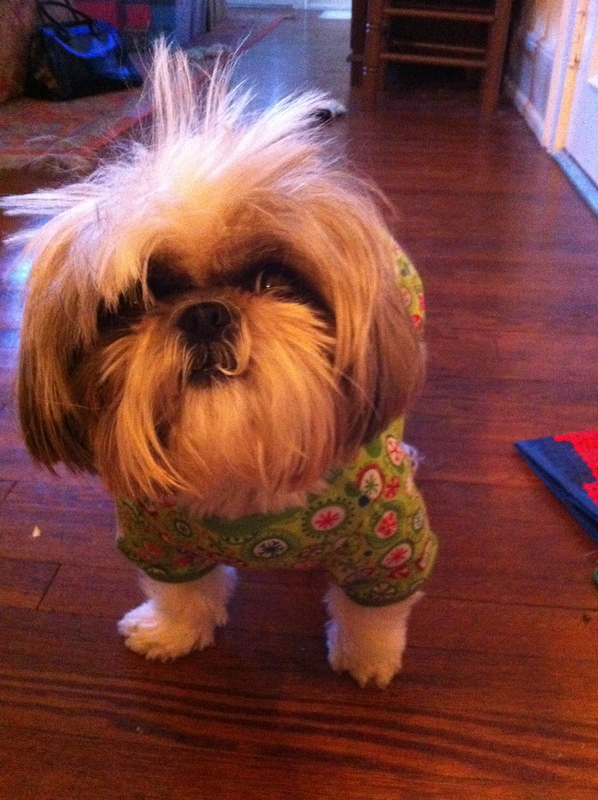 Since I didn’t take any photos of our feast, I leave you with a picture of baby Sophie in her holiday pajamas. Sounds like an excellent start to the new year! We are both fortunate to have sweet and patient husbands who support us. Around my birthday might need to be added to the calendar! For the record I have been imbibing classic cocktails long before Don Draper hit the small screen. Next time you feel a cleaning binge approaching, do what us Abilene Crowe’s do. Call Cathy. I wish I had a Cathy here! I plan on looking for someone soon. As for cocktails, Don made an old fashioned and it was clearly the way you made them for us. Mmm mmm good!